Scientific Background: Hsp27 is one of the most common members of the highly conserved and ubiquitously expressed family of small heat shock proteins (sHsp), which also includes alphaB-crystallin. 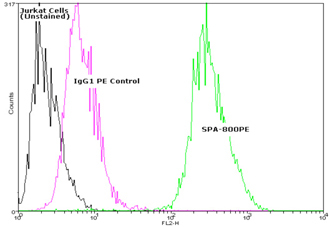 It is characterized by a conserved C-terminal alpha-crystallin domain consisting of two anti-parallel beta-sheets that promote oligomer formation required for its primary chaperone function as inhibitor of irreversible protein aggregation. Hsp27 oligomerization is modulated by post-translational phosphorylation of Hsp27 at three serine residues, Ser15, Ser78, and Ser82, by a variety of protein kinases including MAPKAPK-3, PKAc-alpha, p70 S6K, PKD I, and PKC-delta. Hsp27 has been shown to inhibit actin polymerization by binding of unphosphorylated Hsp27 monomers to actin intermediate filaments. Anti-apoptotic functions of Hsp27 have also been identified through interactions with DAXX7, activation of Akt, and inhibition of apoptosome formation. Evidence suggests altered expression of Hsp27 is implicated in the pathogenesis of breast, ovarian, and prostate cancer.